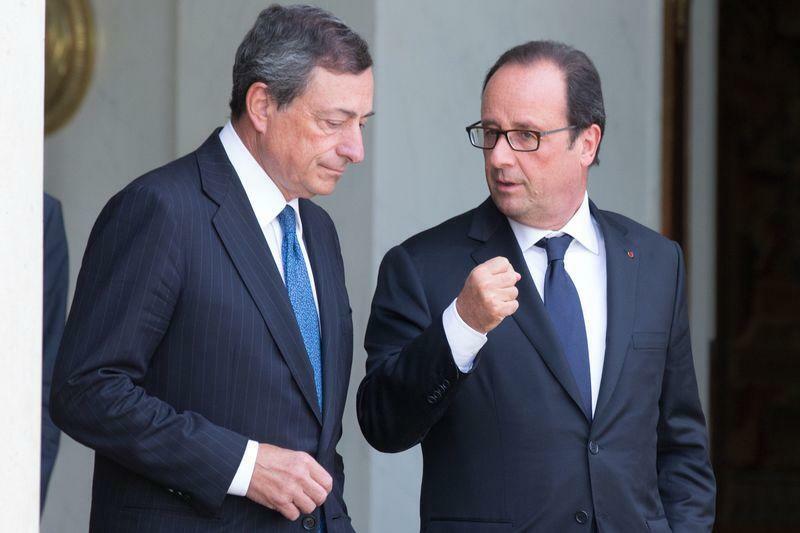 PARIS (Reuters) - French President Francois Hollande and European Central Bank chief Mario Draghi agreed on Monday that deflation and weak growth were threatening the European Union's economy, an official in the president's office said. Draghi called last week for greater emphasis on fiscal stimulus over austerity - comments that irritated German leaders but were welcomed in France because they hinted at a shift away from a current emphasis on budgetary austerity. "I think the diagnosis is a shared one," an advisor to Hollande told reporters after an hour-long meeting between the Socialist president and Draghi at the Elysee presidential palace. The two men shared the view that weak growth and a threat of deflation in the European Union were problems that needed to be addressed, the advisor added. "We need to work together on demand in Europe," he said. France has been singled out as a laggard in an otherwise tepid European recovery due to its weak growth rate, record-high unemployment rate and repeated delays in bringing its public deficit below EU targets. Hollande told Draghi that France - which has already been granted two reprieves by the European Commission on its deficit-reduction targets - would respect commitments to keep enacting structural reforms and bringing down the deficit. "There are rules to follow, and France will respect them," the advisor said. "This will to raise the growth potential with structural reforms is enormously appreciated."